Some back problems are the direct result of poor posture while the sufferer is not even aware of it. Correcting your posture is probably one of the easiest and most affective ways to make sure that the parts of your back and spine keep healthy and aligned. You can see a visual difference in someone when they improve their posture along with reduced back and neck pain. Having the right support and posture will help to make your hours sitting in a chair or standing on your feet be more comfortable. Bad posture is a habit that can quickly end up causing or aggravating your back pain. Eventually, it can even cause spinal problems. Concerning yourself with proper posture is a great way to alleviate some back pain in your home. How does Poor Posture Cause Back Pain? There is no adequate support for the back, the muscles of the back, end up strained placing the spine under excess stress. 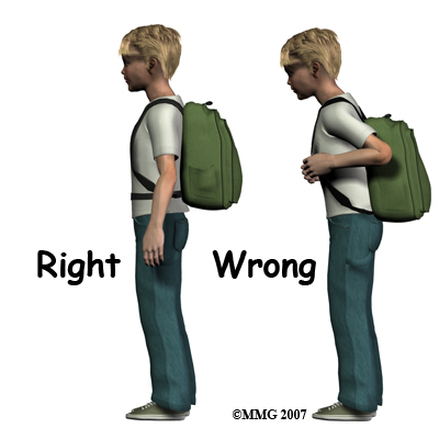 Poor posture, if left uncorrected, can make changes to your spine's anatomical characteristics. Constriction of vessels of blood and nerves can be because of poor posture as well as causing your muscles, joints, and discs to end up hurt in your back. These are major contributors to back pain can also lead to other problems like headaches and tiredness. It can eventually even end up affecting your breathing and other major organs. With proper posture you will help to keep your back supported and balanced. Early in life most people form posture habits and they continue them through adulthood. When sitting, walking or standing you have different positions that make for good posture. Everyone should teach their children at a young age to not slouch. When possible try to keep yourself moving throughout the day. For those that must sit at a desk every day for long periods of time, take some time to move around and stretch out if possible. Walking can even help to alleviate stress that standing may put on your back. By correcting the posture that causes pain in your back helps to bring to an end a painful situation. You can eliminate the pain by correcting the bad habit and fixing up your posture. Maintaining your new posture will also be required to keep the pain from simply coming back. Try getting involved with something like yoga or Martial arts to learn how to sit, walk, and stand using the correct posture position. Keeping your body in good condition means participating in regular exercises like swimming, bicycling, or walking to help you keep your body in good shape as well as strengthen the muscles in your back. Participating in a maintained regimen of exercises will help you get good posture. It will also help to keep those strengthened muscles in your back conditioned to help prevent any more injuries. Prior to starting and exercise program you should speak with a physician who specializes in back related cases. Spinal specialists in London can help you to decide if these activities are safe for you to take part in. They are able to offer pain medications as well to help you get through the pain. But it should not last long, because once your posture gets corrected, the pain will start to go away. With back pain becoming a problem in so many people's lives, it would help for everyone to prepare themselves and act proactively. Correct your posture, exercise daily, and eat healthy. By following these guidelines it should help to avoid some back pain.